What is Mondo Rescue ? 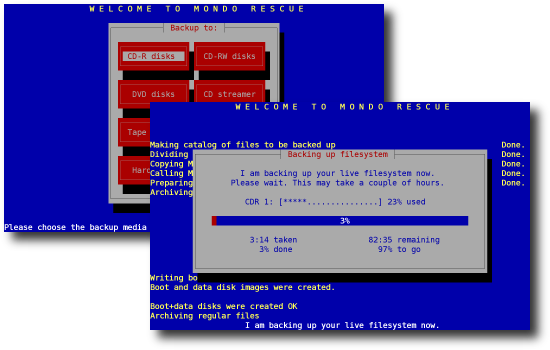 Mondo Rescue is a GPL disaster recovery solution. It supports Linux (i386, x86_64, ia64) and FreeBSD (i386). It's packaged for multiple distributions (Fedora, RHEL, openSuSE, SLES, Mandriva, Mageia, Debian, Ubuntu, Gentoo). It supports tapes, disks, network and CD/DVD as backup media, multiple filesystems, LVM, software and hardware Raid, BIOS and UEFI. You need it to be safe. Hugo Rabson: Creator of Mondo Rescue. The Mondo Rescue original Web site made by Hugo is also still available. Note that the paypal icon there is for rewarding Hugo's work, but has nothing to do with the current development of Mondo Rescue. The project team is happy to announce the availability of a newest version of mondorescue 3.2.2. Enjoy it as usual! As usual source packages are also available in the same directory. The project team is happy to announce the availability of a latest version of mindi 2.1.8. Enjoy it as usual! As for the previously announced version 3.0.4.1 of the project, this is just a maintenance version for the old stable branch, bringing the latest fixes in mindi available from the 3.2 branch for those of you still using mindi 2.1.7. Refer to the log at the end of this announce for details. The project team is happy to announce the availability of a newest version of mondorescue 3.0.4.1. Enjoy it as usual! If you have a bit of time to test the current beta of MondoRescue 3.2.2, that would help us produce the final version more rapidly. For more details, please look at this blog article. This website has been designed according to the W3C standards in order to be viewable by most standard compliant browsers. Since it uses some CSS techniques, it may not render correctly on some non-free (as in freedom) widely used browser. If this is the case with your browser, you may want to try the latest version of Firefox, a standards compliant free software browser. This site is best viewed with the free "Vera" True Type Font from Bitstream.